Finding My Star: How Virginal is Your Olive Oil? Due to Miss Flora being diagnosed as wheat and milk protein intolerant in 2010 and then my own health issues, I started to pay closer attention to our diet. I was particularly interested in reducing the amount of processed foods and wheat products. The more I learnt, the more I wanted us to be eating wholesome, natural foods that are not genetically modified or compromised by shortcuts, additives and lord knows what else to save the suppliers a few dollars. I’ve always preferred to purchase Australian grown food and Australian made products, but, until recently, still bought some items from overseas producers. One of these was olive oil. Because of Italy’s longstanding reputation as the experts in olive oil, I’ve always pounced on Italian produced olive oil when on sale in the grocery store, even more so if it was extra virgin olive oil. I never actually knew what extra virgin olive oil was until recently, but assumed it was better because it was always dearer. Then I read an article on Food Renegade’s blog about how olive oil from overseas, especially Italy, is not only NOT extra virgin, but is often diluted with inferior oils, so it’s not even 100% olive oil. (Read the full article here.) Unfortunately, there’s no simple way to be 100% sure that you’re getting what you paid for. In Australia, all local and imported oils can be put through an authentication test, and if they pass, they can display one of the following stamps. We’re now halfway through 2012 and the only extra virgin olive oil you’ll find on the shelves displaying one of these symbols is Australian. All imported oils that agreed to put their oil to the test have failed. Price is always a factor when grocery shopping, so I was concerned that authentic Australian extra virgin olive oil would be much dearer than the others. I am pleased to say that I found a few brands in Coles that displayed the authenticity stamp. One in particular (Jingilli extra virgin olive oil fruity & mild) came in a 2 litre cask and worked out to be only 95 cents/100 ml (Note: This was on sale at the time). I was ecstatic, especially since the 500 ml bottle of Bertolli extra virgin olive oil was $1.00/100 ml. Sorry Italy! From now on I’ll be buying Australian extra virgin olive oil. 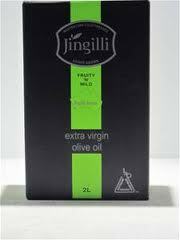 Oh, and just in case you want to Google Jingilli olive oil to learn more about the company, make sure you get the spelling right. I couldn’t remember the name and put in Jiligi, Jinligi or something similar with the words olive oil, and the first item in my search results was someone asking a question on Yahoo Answers about whether it was safe to use olive oil when masturbating.